The next recipe book I will be reviewing is Jackie Cameron Cooks At Home. Now that I have a plan of action on how to tackle my reviews by making the cover recipe, I feel a lot less daunted by the huge pile of amazing books I have on my bed side table. Jackie has three photographs on her cover and the first one I have made is the recipe for raisin filled rusks. Rusks are the South African equivalent of biscotti. As I wanted to stay true to the recipe (other than the sugar) I went out and bought a 400g box of Kellogs all bran flakes with sultanas. My intention was to make half the recipe and as I only needed 33 grams of all bran flakes and 58 grams of sultanas, this worked out perfectly for me as the sultana content was meant to be 15% of the 400g. I sifted out the sultanas to weigh them and lo and behold, they weighed 29 grams. This was less than half of what should have been in the box. I quartered the recipe and made a mistake of not using a deep enough tin. What resulted was a height bigger than a biscotti and smaller than a traditional rusk. The top was slightly overcooked but they are extremely tasty and I will make these again with a few adaptations to suit what is in my pantry. I love these rusks, Tandy and I really like the dark crust!! LOVE homemade rusks dipped in tea! Yum!! I love raisins and these look a delicious. Ooh, never heard of these. They look great. Oh yum! I can snack on these all day! Looks great Tandy. Looks like it can be a great homemade breakfast! 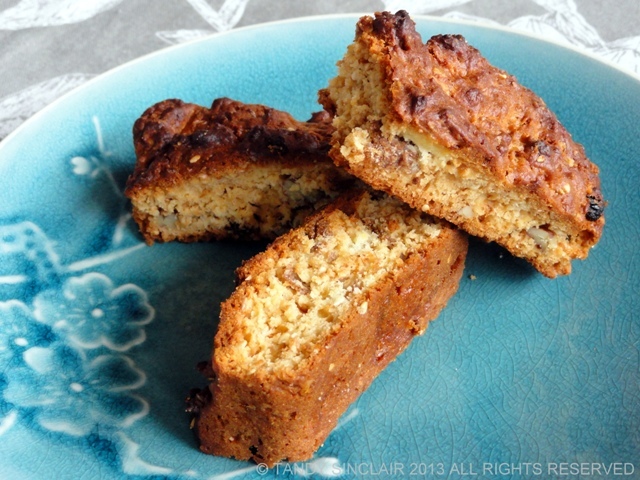 oooh, any recipe resembling biscotti definitely catches my attention! I love how different cultures have similar recipes. I love the mix of nuts, raisins and coconut, absolutely sounds delicious! I’ve not had rusks with apricots in before. What a great idea! Loads of lovely flavours in these rusks Tandy. And all of them good! Give me a cup of coffee and a few of these to dip in it and I’d be pretty content!